The Vegan Magpie: Vx Black Friday offers! Hello! Vx London have an offer for you if you live in London or if you shop online! In their London shop, you can get 20% off purchases over £20 by printing this coupon: https://www.vx-london.com/black-friday-coupon and taking it to the shop. This is valid Friday-Sunday. 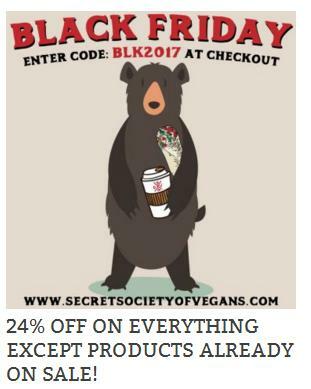 If you shop with them online, head to https://www.secretsocietyofvegans.com/ and use the code BLK2017 for 24% off! This does not work for items already in the sale. Don't forget to consider postage costs with your order. This site sells a lot of harder to find items, so is well worth a look!